The Zambia Airports Corporation has announced that it will transform the existing Kenneth Kaunda International Airport into a domestic terminal. This is part of the Corporation’s infrastructure development projects aimed at upgrading the four international airports namely Kenneth Kaunda, Simon Mwansa Kapwepwe, Harry Mwaanga Nkumbula and Mfuwe. In a statement, Zambia Airports Corporation Limited Spokesperson Mweembe Sikaulu said these infrastructure development projects were embarked on in a quest for better passenger and cargo facilitation. Ms. Sikaulu said the on-going work at Kenneth Kaunda International Airport is at a cost of nearly US$360 million exclusive of local taxes and is being carried out by China Jiangxi Corporation for International Economic and Technical Cooperation. “Part of the scope of work is the rehabilitation and refurbishment of the existing airport which shall be turned into a domestic terminal once the newly constructed international terminal is complete,” she said. China Jiangxi has subcontracted a local consultancy firm, Zulu Development Consultancy to design as is and make proposals on the rehabilitation of the terminal that will house executive lounges, charters, low cost carriers, general aviation, café’s, restaurants, banks and other amenities. “We are appealing to the travelling public to bear with us through this process as services will be affected though we shall try by all means to keep them running with minimal invasion possible considering the circumstances,” Ms Sikaulu said. She however said that once done, Zambia Airports shall deliver an upgraded terminal building with international standards that will rival others in the region. China Jiangxi Corporation for International Economic and Technical Cooperation are also expected to construct new taxiways, aprons, rescue and fire services stations, landside and airside driveways as well as an Air Traffic Control Tower. The Kenneth Kaunda International Airport upgrade project is anticipated to be completed in 2018. 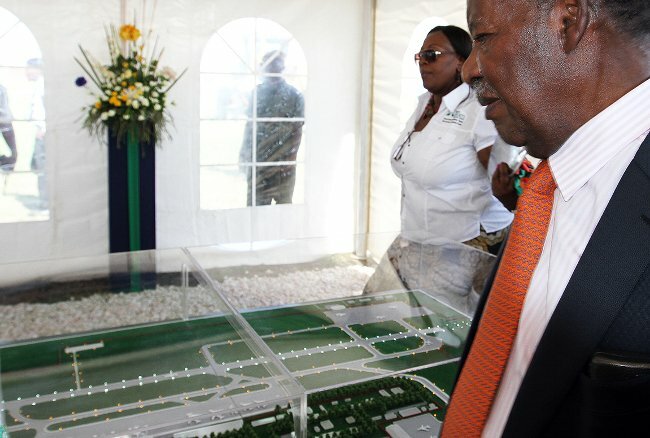 Over 4000 jobs will be created with the upgrade and completion of the Kenneth Kaunda International Airport. The Kenneth Kaunda International Airport upgrade project is anticipated to be completed in 2018. Thats simple Naomieglish. So a quarter of the zambian population will be able to occupy the airport at any one time??? i.e. 4 million capacity??? please we know it an election year, stop Pa bufi!! It is about time! The current terminal is an embarrassment indeed. After transiting through a number of airports, both in Africa and the Western world, going back home and arriving at KKI feels like you have just been forced into a time-machine and thrown back to the Welensiky (sp) era when aviation in Zambia was still in its infancy. @Naomi, read the article again! KEY PART: “We ARE…”, not “We WILL be…” (PRESENT vs FUTURE tense.) So it is safe to assume something must already be taking place there. @Fota Nkonde, I think when you are clueless about certain issues/things it better to stay quiet than expose your ignorance. There is nothing wrong with the “four (4) million capacity building” part of this statement. Airport/terminal capacities are measured in terms of the number of people the facility/building is designed to handle in a given year. And NOT at once! That is, the number of people/passengers the terminal will be able to safely, conveniently, and properly service over a period (usually over a year). It doesn’t mean the facility can accommodate 4 million marketers, cow headers, kaponyas, street venders, fish mongers, extra, at one time. Were has the reasoning and thinking gone to among some Zambians??? Big Up PF we are delivering! Why do they still paste pictures of that “thing” when it’s all rotten up already and stinking! This is good news…but why the Chines if you have $360m why not get other main contractors to do the job? For the first time this moron has posted sensible issue, congratulations Jay Jay. you are growing up soon you will joint the most progressive party The P. F.
Why NOT the Chines @ Jay Jay if they can do the work? Probably cheaper than whoever you have in mind. Never been to China, but I know Chines contractors/engineers know how to build things just as well. Ask those who attended the Beijing Olympics about the Bird’s Nest Stadium/Arena—nothing sub-standard about that! And TAZARA rail line, built with yester-years-technology by, the Chines still standing with very minimal maintenance. So what’s this ‘beef’ you have against the Chines contractors? When you take a closer look at the Project briefs on those selfsame projects you have mentioned you will find that the architects and the main contractors were not Chinese firms…I’m familiar with this sector and the Chines are not the top contractors for that specification unless this is linked to funding via a Chinese Devlopment Bank. Practically everything that is being built by the Chinese. Some people were born to insult, they can’t just sit back and relax if one has nothing to contribute to the topic at hand. Internet was not created as a platform for insulting people. Instead make good use of it. Those airports have a far far bigger capacity than the figure mentioned in the article above!! Sometimes I wonder some imbeciles no matter what good the government does they will find something to complain about please people instead of complaining why don’t you bring your brilliant ideas to the table and work with the government . This government cancelled this upgrading of KK Airport sighting corruption by the MMD with the Turks…good…then went and chose another contractors…but this selfsame deal itself has been linked to corruption…..if they cancelled and overhauled the procurement and tendering system then select a contractor I would overjoyed. the french and the singaporeans have built a masssive,modern and world class airport in Mauritius…..
hope the chinese will take us one better…. All the best with reaching your deadline. My only worry is the CHINA man is doing the construction which scares me alot. My advice is please hire some serious experts for inspection to avoid deaths in the future.